The fenestration industry understands the need for creating peace, safety, and security inside the four walls of your house. Your home is the place where a person wants to come and feel safe and relax after a hectic day of work. They want to peacefully sit and talk to their families and at night have a soothing sleep. This scenario in today’s time has become a little difficult, especially in places like Bangalore as the noises, pollution, and the constant fear of safety has taken over half the space in everyone’s mind. 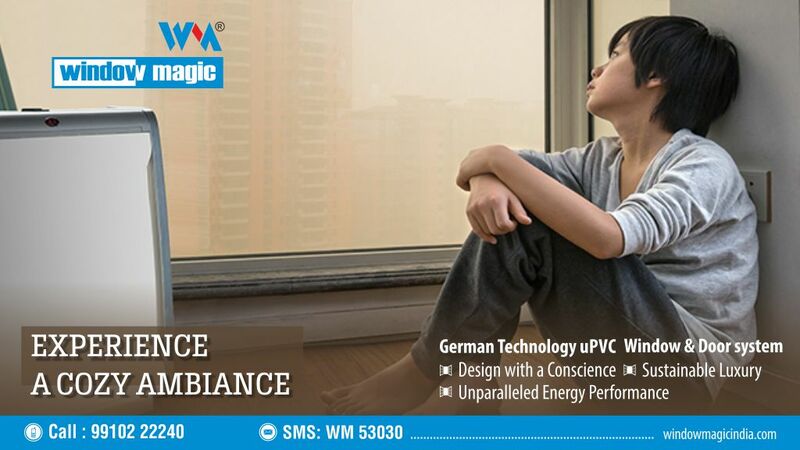 Window Magic’s uPVC windows and doors provide you with what you look for. The uPVC windows in Bangalore have the insulation capacity that cancels out the noises outside your house. With double and triple glazed windows, the outside noise gets blocked and is restricted from entering the house. This gives your house a peaceful environment to relax in and have a serene time with your friends and families. The locks installed on your uPVC windows and doors ensure complete safety and security. The uPVC window manufacturers in Bangalore provide with a strong locking system that doesn’t easily break with any adverse external stimulus. The burglars and robbers cannot easily break through the doors thus providing you a high-end guarantee of security. The durability and strength of uPVC windows and doors are much higher than that of traditional aluminum and wooden windows. Aluminum and wooden windows wear off with time and need replacement. Heavy rain, cold, and heat tamper their quality thus weakening them over time. The uPVC doors and windows in Bangalore ensure high-end quality that resists every kind of climate and weather adversaries. They are corrosion proof and doesn’t decay or get weak with time, ensuring long durability and strength. If you are looking for uPVC windows in Bangalore, contact Window Magic and get home a new definition of style, class, and aesthetics.